For this post-Thanksgiving week, I'd like to suggest a remarkable video produced over two decades by NASA scientists. Satellites monitored populations of plant life on land and oceans, mapping variations of green regions of vegetation and snow cover on the North and South Poles. As seasons pass, we witness a rhythmic dance between white and green, as if the planet itself were breathing. Vegetation on land is represented on a scale from brown (low vegetation) to dark green (lots of vegetation). In the ocean, populations of microscopic phytoplankton — a type of algae that uses sunlight to turn water and carbon dioxide into oxygen and sugar — are indicated on a scale from purple (low) to yellow (high). We see the Earth changing daily and with the seasons as a living planet — its plants, surface winds, and sea currents responding to the energy coming from the sun. 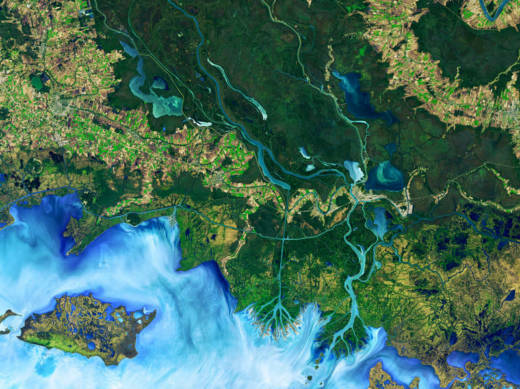 The visualization collated data from Earth-observing satellites like the Sea-viewing Wide Field-of-view Sensor (SeaWiFS), which started collecting data in 1997, and the Terra, Aqua, and Suomi NPP weather satellites. The changes over the past two decades help scientists understand how the planet is responding both locally and globally to warming trends. Warming ocean temperatures, for example, slow the growth of phytoplankton and, thus, its ability to remove carbon dioxide from the atmosphere. Also visible is the shrinking of the polar caps as the years go by. Going out into space is not only for the purpose of looking outwards. It allows us to look back at our planet as a whole, follow its changes and rhythms, so that we can better learn how to coexist with it and protect its resources for generations to come.